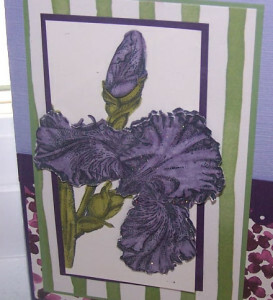 Today I have a handmade Thinking of You card that I made using a retired Stampin’ Up! Stamp set Kindness Is. This is one of those stamps that I will never sell. I am a gardener and love all things floral and love purples. So my favorite new Designer paper from the Spring Occasions catalog is the Painted Petals Designer paper which has beautiful floral scenes. This card was inspired by the Mojo Monday sketch for this week. Cardstock: Wisteria Wonder cut to 5 1/2″ x 8 1/2″ and scored at 4 1/4″ for the card base. Next is a piece of Painted Petals Designer paper cut to 4″x 2 1/2″ and layered onto a piece of Elegant Eggplant that is 4 1/8″ x 2 3/8″. The edge of the designer paper is embellished with a 4″ piece of elegant eggplant that has been punched with the lace border punch. The next layer is a 3″ x 4 3/4″ piece of the Wasabi stripped designer paper layered onto a piece of Wild Wasabi cardstock cut to 3 1/8″ x 4 7/8″. 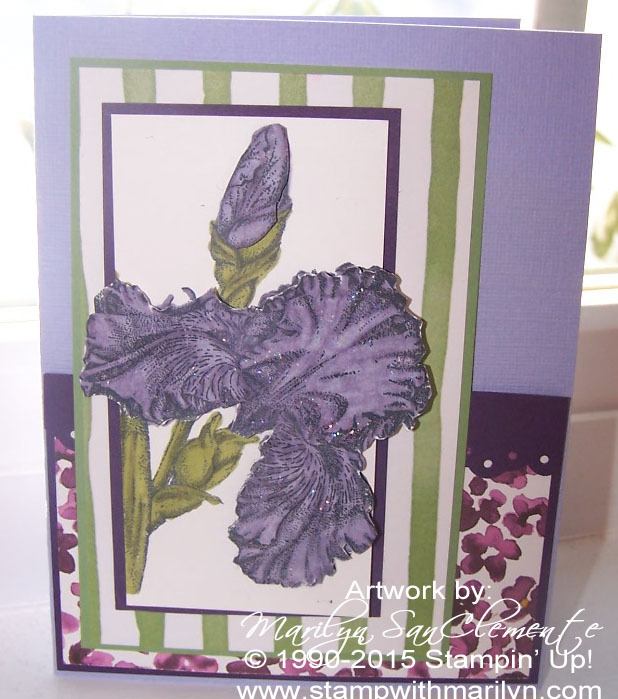 The Iris is stamped onto a piece of Whisper White cardstock cut to 2″ x 4″ with Momento Ink. I then stamped the Iris a second time onto a scrap of whisper white cardstock with Moment o ink and colored the Iris with the Blendabilities Markers. I used the Old Olive and Wisteria Wonder Blendabilties Markers to color the Iris. Carefully cut out the Iris that is stamped and colored and layer onto the first piece with dimensionals. The Iris is layered onto a piece of Elegant Eggplant that is cut to 2 1/8″ x 4 1/8″. Last but not least, I added a little sparkle to the veins of the Iris with Dazzling Details. Such a pretty card. Love the purple and green and that gorgeous flower image. Thanks for playing along with Mojo Monday!